Why does GPS sometimes show me in the wrong place? What is the government's commitment to GPS accuracy? How accurate is GPS for speed measurement? How accurate is GPS for timing? Doesn't the government degrade civilian GPS accuracy? It depends. 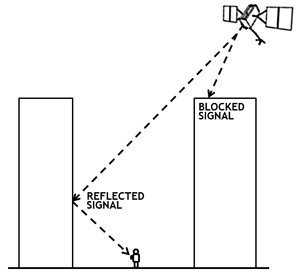 GPS satellites broadcast their signals in space with a certain accuracy, but what you receive depends on additional factors, including satellite geometry, signal blockage, atmospheric conditions, and receiver design features/quality. For example, GPS-enabled smartphones are typically accurate to within a 4.9 m (16 ft.) radius under open sky (view source at ION.org). However, their accuracy worsens near buildings, bridges, and trees. High-end users boost GPS accuracy with dual-frequency receivers and/or augmentation systems. These can enable real-time positioning within a few centimeters, and long-term measurements at the millimeter level. Satellite signal blockage due to buildings, bridges, trees, etc. Missing roads, buildings, communities, etc. To calculate its position, a GPS device measures its distance (range) from multiple GPS satellites. URE is a measure of ranging accuracy. User accuracy refers to how close the device's calculated position is from the truth, expressed as a radius. As with positioning, the speed accuracy of GPS depends on many factors. 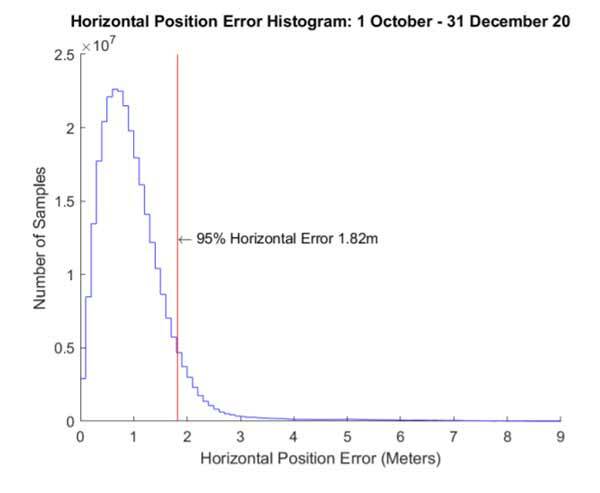 The government provides the GPS signal in space with a global average user range rate error (URRE) of ≤0.006 m/sec over any 3-second interval, with 95% probability. This measure must be combined with other factors outside the government's control, including satellite geometry, signal blockage, atmospheric conditions, and receiver design features/quality, to calculate a particular receiver's speed accuracy. GPS time transfer is a common method for synchronizing clocks and networks to Coordinated Universal Time (UTC). The government distributes UTC as maintained by the U.S. Naval Observatory (USNO) via the GPS signal in space with a time transfer accuracy relative to UTC(USNO) of ≤40 nanoseconds (billionths of a second), 95% of the time. This performance standard assumes the use of a specialized time transfer receiver at a fixed location. 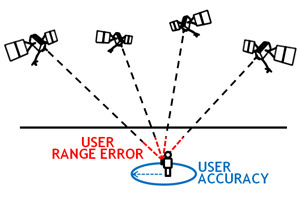 The user range error (URE) of the GPS signals in space is actually the same for the civilian and military GPS services. However, most of today's civilian devices use only one GPS frequency, while military receivers use two. Using two GPS frequencies improves accuracy by correcting signal distortions caused by Earth's atmosphere. Dual-frequency GPS equipment is commercially available for civilian use, but its cost and size has limited it to professional applications. No. During the 1990s, GPS employed a feature called Selective Availability that intentionally degraded civilian accuracy on a global basis. In May 2000, at the direction of President Bill Clinton, the U.S. government ended its use of Selective Availability in order to make GPS more responsive to civil and commercial users worldwide.